Your businesses records are what keeps your business running, but keeping them well managed and organized can be a source of a lot of stress. 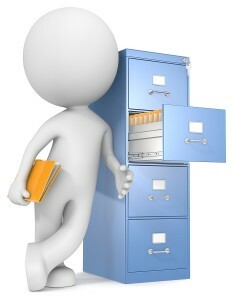 It can be tough deciding what is the best way to maintain your documents for your office. The two most popular ways to manage your documents are either using a records management software, or physically storing paper documents. Each of these options have their own pros and cons that should be weighed, but by properly maintaining either method could substantially help your business grow. When it comes to using records management software, the part that can be difficult, is the setup. Not only can it get a little pricey when you first start but it can also be a pretty big project to take on. It can be very beneficial and time efficient to hire an outside company to make sure that all of your records are scanned properly and into your system organized correctly. Once everything is in the system, it is much easier to maintain your documents. You are able to access all of your records within seconds as opposed to having to run around the office trying to find a file. When you keep all of your records in paper form, it can be harder to keep track of them and you raise the risk of losing important information. You have to pay for an offsite facility every month if you wish to store the documents at a separate location. Security can be an issue when you choose to use paper storage. It’s very important to maintain strict record retention policies and properly dispose of all confidential documents. Remember that every office is different and it is up to you to decide the best way for your office to maintain your records. Each solution has its ups and downs, but depending on your office’s needs one of these can help you grow your business!